An article – “UK ambassador visits Papua to counteract ‘false information’ spread by ‘certain groups’ in London” – that appeared in the usually accurate Bintang Papua outlet on December 14, contained much false reporting in the original Bahasa Indonesia version, according to both Papuan journalists and the spokesperson for the British Embassy in Jakarta. The Bintang Papua article, written by journalist Makawaru Da Cunha, who uses only his initial “MDC,” reported that “The British Embassy to Indonesia has described the situation in Papua as ‘very peaceful and conducive’. It is quite different from the information being disseminated by certain groups to the British government.in London”. However, according to the British embassy in Jakarta today, this statement was not made, nor was the staff officer identified in the article, Millie McDevitt, able to speak with the press. “Mrs Millie McDevitt, political officer at the British Embassy, visited Papua last week as part of the British Embassy’s regular programme of Provincial visits. While there, she met a range of political and security representatives as well as the NGO and religious communities. The spokesperson also said that the article “was littered with inaccuracies”. Sources for West Papua Media who declined to be identified have claimed that the article, appearing in an outlet that is usually known for accurate reportage, was allegedly written by an Indonesian journalist in the pay of the Indonesian police. 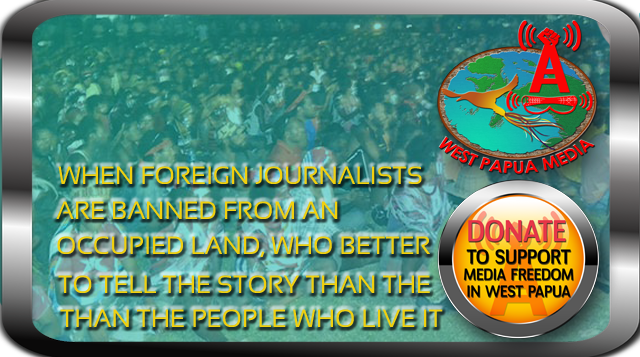 West Papua Media has not yet been able to check the veracity of this particular claim, however there has been extensive prior reporting on the involvement and interference of Indonesian security and intelligence agencies in newsrooms in West Papua. Numerous Papuan journalists today have raised concerns that this level of misreporting could significantly harm relations between the UK and Papuan people. Bintang Papua, 14 December 2012 The British Embassy to Indonesia has described the situation in Papua as ‘very peaceful and conducive’. It is quite different from the information being disseminated by certain groups to the British government.in London, she said . The Special Staff of the British Embassy’s political section, Millie McDevit made these comments during a visit to the chief of police in Jayapura, Police Inspector-General Tito Karnavian on 13 December. Mrs McDevit said that she had made a special visit to the chief of police in order to get confirmation directly from him about information being spread by certain groups who allege that the situation in Papua is far from peaceful. She went on to say that such information was being spread every time Papuans suffered discrimination by the Indonesian government, especially by the TNI – the army – and Polri, the police force. She said that after visiting a number of places especially in Jayapura, she could see that things were very different indeed from what is being conveyed to the British government. She said that security and development are proceeding very well in Papua and she expressed support for what the police in Papua are doing to combat corruption because combating corruption is the best way to improve people’s welfare. The police chief Tito Karnavian said that they had provided plenty of information to the Special Staff of the British Embassy’s political section in order to contradict all the negative information being spread about the situation in Papua. ‘She decided to come to Papua to check the information,’ he said. Karnavian also said that they had asked the British government to provide the police in Papua with special equipment to check people’s DNA. At present, the police have to identify people involved in violence and shootings by checking the evidence outside Papua. ‘If we have the equipment to check people’s DNA, this will help to enhance the ‘supremacy of law’ here in Papua,; he said.